UK developer Playtonic has removed the controversial YouTuber JonTron from its upcoming title Yooka-Laylee. JonTron - real name Jon Jafari - has found himself in the news in recent weeks following a series of far-right views about immigration, ethnicity and nationalism. Jafari is the founder of channel network Normal Boots, plus the host of a series of other YouTube shows. He personally has over 3m subscribers to his channel. His views were made apparent on Twitter and spilled over onto a video stream, and included the idea that Mexican immigrants are attempting to claim parts of America. He reportedly lost a number of subscribers on the back of the controversy, although he has since attempted to clarify and downplay some of those views. In February 2015, when it became apparent that Jafari was a big fan of Banjo-Kazooie, Playtonic invited the YouTuber to voice a minor character in Yooka-Laylee - the spiritual successor that generated over £2m via Kickstarter. An offer that was accepted. However, following the recent controversy, the developer has decided to remove him from the game. The title launches on April 11th. "We recently became aware of comments made by voice artist JonTron after development on Yooka-Laylee had been completed," the firm told GamesIndustry.biz in a statement. "JonTron is a talented video presenter who we were initially, two years ago, happy to include as a voice contributor in our game. 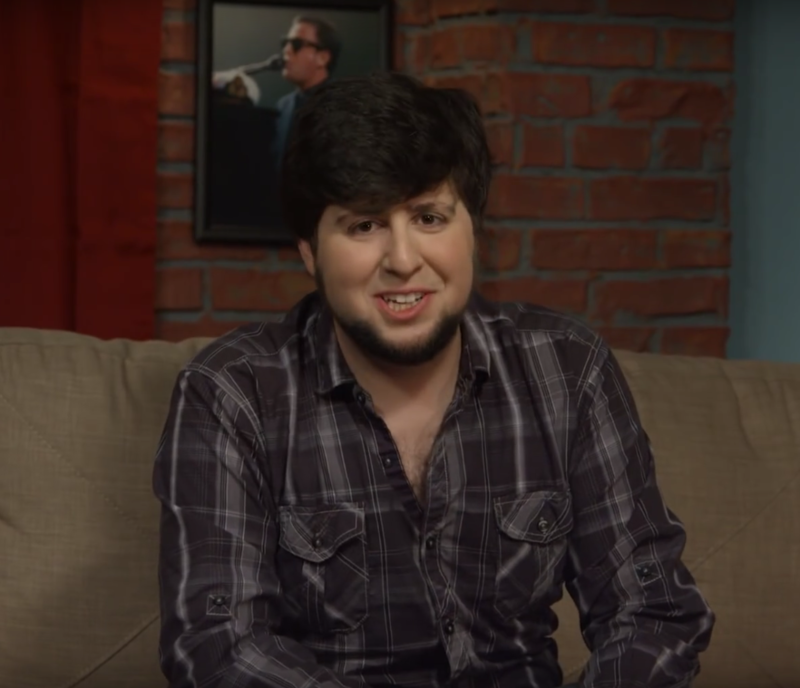 However, in light of his recent personal viewpoints we have made the decision to remove JonTron's inclusion in the game via a forthcoming content update. We would like to make absolutely clear that we do not endorse or support JonTron's personal viewpoints and that, as an external fan contributor, he does not represent Playtonic in any capacity. Playtonic is a studio that celebrates diversity in all forms and strives to make games that everyone can enjoy. As such, we deeply regret any implied association that could make players feel anything but 100% comfortable in our game worlds, or distract from the incredible goodwill and love shown by our fans and Kickstarter backers." Update: Jafari has responded to Playtonic's decision on Twitter. He wrote: "Unfortunate to see Playtonic remove me from Yooka Laylee, but I understand their decision. I wish them the best with their launch!" Shouldn't we have higher standards than linking back to tabloids like Kotaku and less than reputable news sources like Polygon? You could've just embedded/linked the tweets instead of going for inflated second party opinions. We support diversity as long you don't diverge from our support of diversity. @Ruben Monteiro: I agree. Pretty gutted for Jon on this one, even if what he said is deemed #2edgy4me. I think it's perfectly reasonable for a company to cut ties with someone who starts spouting racist nonsense, but perhaps that's just me being overly intolerant. Of racists. @Ruben Monteiro: Do you mean supporting diversity needs to come with supporting views not supporting diversity? Doesn't that look antithetical to you? When you *$&! on people, they stop wanting to help you. @Marcelo Careaga: I think you either support diversity or you don't, and it's perfectly valid not to, like they did in this case by excluding someone that didn't match their ethics. But doing that while at the same time claiming to "celebrate diversity in all forms"? I just think it's bad phrasing and sounds contradictory to me. @Ruben Monteiro: 'Diversity' is shorthand for 'a diverse community of positive cultures, genders, orientations, etc' It doesn't mean you have to accept 'Hitler was right' just because that's one of many diverse opinions. Now, what's positive and what's not? That gets more contentious. Mostly we agree that more food is always good (even Brits have a few good foods) and for other things it's fuzzy, but it's clear JonTron's factually wrong and nasty comments about black people aren't the sort of thing that add positiveness to a community. If you want to complain about the word 'diversity' being appropriated from its literal meaning then take it up with words like 'terrorist', or poor 'freedom', which is being violently abused right now. I seriously just went through the painful process of registering on this site, just to inform you @Ron Dippold that no, that is NOT the definition of diversity. That's adorable, but the definition of diversity is simply "the state of being diverse; variety". That's it. You can't say what's "Good", or "Positive", and in the same way you can't say what's "Bad" or "Nasty", because that is COMPLETELY subjective. For instance, I could say you're a damn evil person, because you support communism, and thus YOU should be silenced and shut down, but I imagine you'd have problems with that. This being said, the viewpoints and ideas expressed by JonTron are not supported by hidden racists, nor did a bunch of magically evil people emerge from the forests to vote in this past election. His views clearly haven't detracted 3 million people subscribed to him. What you are effectively saying, is that JonTron, and roughly half the nation, are "wrong" and "nasty". That is insane. You are effectively saying millions of people are evil, which is not even vaguely true, but that's how you see them. You create the habits, patterns, and power to silence unpopular opinions, or popular ones, and the minute someone you don't like gains power you've given them power to silence you. So yes, you even let nutjobs that say "Hitler was right" talk, just as much as you do people who say "Che Guevara was a nice guy" continue to talk, because if you silence an opinion you don't like, it will just make that opinion more popular. @Eric Hoyt: Sigh. I'm just telling you what Playtronic likely means when they say 'diversity', and why it's not hypocritical for them to dump him. It's what people who say 'diversity' without sneering and spitting on the floor mean. You can of course quote me the dictionary definition, and I'll go 'Wow I did not know that, having no access to a dictionary, boy do I feel silly.' Maybe they should explicitly say 'positive diversity' to head off the concern trolling - seriously, that's a good idea. JonTron said, among other crazy things, quote, “Wealthy blacks also commit more crime than poor whites. That’s a fact. Look it up." It's not a fact. And it's not even a freedom of speech thing, this is a private company deciding they don't want to be associated with a dumbass - that's bonafide freedom of association right there. Gaming's reputation is dismal enough already. When you call out people on their BS is the very definition of free speech. You do not oppress anybody by calling their bluffs and agitation. Freedom of speech does not result in anybody having the right to say anything without consequences, especially when you cross into slander and hate speech territory. You can say it alright, but everybody else has the right to respond as well. Being cut from a game is the least of it. Laws against slander and hatespeech are real, 'look it up'. @Ruben Monteiro: There is a difference into having a particular set of ideas, and being openly xenophobic and spread hateful ideas. I don't think that is hard to see. You are also taking wrong how "diversity" work; it's doesn't mean that they have to tolerate absolutely everything and everybody. @Eric Hoyt: They're not silencing him. He, as you just pointed out, has a YouTube channel with THREE MILLION subscribers. What they've done is say: "what you've said is repugnant to us, please leave our house and express your views elsewhere." Surely you can see the distinction between that and whatever bizarre Communist Stasi police state you've dreamt up? @Eric Hoyt: So, you registered to take a statement about diversity ON PEOPLE, take it out of context, suggest that somebody is a socialist and use such idea to take credibility away from him? Honestly, I think you could have saved the time for that. "So yes, you even let nutjobs that say "Hitler was right" talk, just as much as you do people who say "Che Guevara was a nice guy" continue to talk, because if you silence an opinion you don't like, it will just make that opinion more popular." There is where the problem is; you confuse "disagree with a point of view" with "try to silence somebody". He's not silencing anybody (Arguably, that would have been Playtonic in this case); when somebody (anyone) writes something or say something he has that right, of course, but people around him have the right to challenge, disagree, or state his opinion about his idea. That is what Ron did here, he did not try to silence him at all: he challenged his idea and stated his desired (also a right) of not listening to a guy that he considers racist. Now, with this stated, let me remind you how you registered in the web JUST to answer him. You focused your entire statement into proving him wrong, suggesting he has personal issues against the guy instead of his ideas and a secondary and kinda shy (everyone noticed, I'm afraid) attempt to discredit him by putting him in the socialist spectrum, which I'm going to guess you dislike. So basically: Rod was trying to "disagree with a point of view", and you tried to "silence somebody"
Failing to see how people can view this as "silencing unpopular views?" It's as simple as, they are a company that employs many people, some of which are mexican. By endorsing this guy they are sending a clear message that they do not respect their mexican employees. They also serve many people, some of which are mexicans. It's not about saying half the population is evil, just that those views are not what they endorse. And if half the population hold irrational fears that mexicans are trying to take over I'd think there was a serious issue with the mental health of the nation - though a quarter of voters did believe the Pizzagate hoax! @Ron Dippold: I'm sorry but their exact phrasing according the article is " celebrates diversity in all forms". ALL means ALL. It's not "all, except X". Maybe they should have used "positive diversity" as you say, but they didn't. So it does come across as hypocritical. @Ruben: when people say diversity in all forms, they mean it within a context of acceptable views. For example pedophilia would fall in the net of "ALL," but clearly when people praise diversity they're not intending to include pedophilia. If you can understand that it should not be difficult to understand why racist views (including irrational racial fears) is also not within the context. Celebrating diversity does not mean giving a platform to the undiverse. Celebrating diversity does not mean celebrating bigotry, hatred and ignorance. You cannot celebrate inclusion by accepting exclusion. It's PlayTonic's game, they made it, they're under no obligation whatsoever to include anyone's contribution to the game. Every game developer has worked on code, art, assets, which have been cut from the game - do you hear them all moaning? The game isn't even finished yet, so I'd argue that saying he's been "removed" from the game is spurious. @Jim Webb: "Celebrating diversity does not mean celebrating bigotry, hatred and ignorance." I'm afraid it does (though I'd use the word "accepting" rather than "celebrating", for bigotry, etc). Otherwise all that you're doing is excluding people you label as ignorant/bigots/haters (which is a subjective label you put on them, not an objective reality), and then celebrate diversity with the set of people that do conform to your ideas, which you believe to be the absolutely correct ones. Seriously, Ruben. It's not about thought policing. It's how you choose to act. We all have bad thoughts now and then, but most of us recognise the difference between acceptable and unacceptable. And yes, this is a social construct, and that's a good thing - if it was all based on dictionary definitions we could never improve society. We don't progress by accepting all viewpoints uncritically as you propose. This is an old solved issue, called the Paradox of Tolerance. Pretending it's a radical new thought is a weird modern perspective. "Freedom of speech to those who would use it to eliminate the very principle upon which they rely is paradoxical" to quote Popper. Unlimited tolerance must lead to the disappearance of tolerance. Therefrom in the name of tolerance, their must be restrictions on the tolerance of the intolerant. This is a logical truism. Even the most staunch freedom advocate admits we must restrict people in certain ways to preserve our way of life. But everyone makes their own decisions on where that line is. We are all free to do so, but pretending unless someone advocates total unlimited tolerance we aren't being tolerant is being logically unsound and perhaps even willfully malicious.